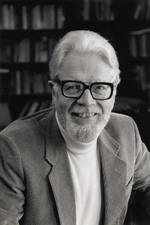 The International Society for the Study of Narrative bestows its first Lifetime Achievement Award on Wayne C. Booth, who sadly passed away in the interval between the Executive Council's decision to give him the Prize and this year's conference. Wayne spent his scholarly career pursuing two intellectual passions, narrative and rhetoric, and, beginning with his monumental first book, The Rhetoric of Fiction, he succeeded in bringing them together in what we call today the rhetorical theory of narrative. Indeed, for Wayne, there was no real division between his books on rhetoric and rhetorical criticism such as Modern Dogma and The Rhetoric of Assent (1974), Critical Understanding (1979), and The Rhetoric of Rhetoric (2004) and his books on literature, especially narrative, such as The Rhetoric of Fiction (1961), A Rhetoric of Irony (1974), and The Company We Keep (1988). Rather, he saw both rhetoric and narrative as ways of thinking, and he thought more deeply and more influentially about the interrelations between those ways than anybody else. In the course of his inquiries, he developed many tools of narrative analysis that theorists, critics, and teachers of all persuasions have found indispensable. Indeed, such terms and concepts as implied author, unreliable narrator, and stable irony are so much a part of our lingua franca that we frequently use them without attribution. But Wayne's contributions to our field go beyond what any listing of his books or any litany of the implements he's added to the narrative theory toolbox can convey. Wayne also modeled an exemplary mode of conducting intellectual inquiry and, in so doing, inspired many of his students to carry on in that mode even as he became a wonderful ambassador for narrative studies. Wayne viewed all his work as work in progress, because he valued intellectual inquiry for its ability to generate as many questions as it answered. Thus, Wayne regarded The Company We Keep, his 1988 book on the ethics of fiction, not as his response to the emerging ethical turn in literary studies, but rather as his effort to revisit and revise the answers he gave to questions about "the morality" of fiction 27 years earlier in The Rhetoric of Fiction. And he always spoke at and attended conferences, including many of those of the Narrative Society, with the goals of looking for new ideas and challenging his own thinking. He encouraged his students, many of whom are here today, to conceive of their own work in the same way, to test it not according to its degree of adherence to any particular theory (even his own) but rather according to its ability to meet the more general standards he advocated in Critical Understanding. Those standards are vitality, the extent to which the work contributes to the life of the scholarly community; justice, the extent to which the work is scrupulous and responsible in the execution of its methods; and understanding, the extent to which it contributes to our knowledge and appreciation of other minds. Wayne was influential not only because of his wide learning, his intellectual depth, and his argumentative rigor, but also because of his generosity of spirit. In his books, he worked to create an implied author his readers would genuinely want to meet—and we know from our own experiences teaching his texts that he succeeded. In his life, he worked to create a real person who would live up to that image: a man who was as self-deprecating and whimsical as he was wise, profoundly skeptical of professional pieties, and profoundly interested in other people and what they had to say. His commitment to undergraduate education was unflinching, largely because it was grounded in the joy he received from listening to what college students had to say. More generally, as For the Love of It made clear, his professional life was paradoxically grounded in a commitment to amateurism: his sense that literature is a gift (wonderfully exemplified by the youthful Booth's joy at being accepted into the Book of the Month Club); his sense that music (or literature) is always greater than the performer (or critic); his sense that art is something one must aspire to, not conquer; most of all, his belief that conversation is more important than competition. Because Wayne Booth met these standards so well for so long, the Narrative Society is proud to give him its first Lifetime Achievement Award. For the same reasons, the Narrative Society is proud to announce that hereafter it shall call this prize the Wayne C. Booth Lifetime Achievement Award.